For years, winemaking has been a mysterious craft that few dared to explore.The closest I ever got to learning about winemaking was taking a tour at a local vineyard and stomping grapes at the end. Like me, most wine drinkers are more concerned with which wine to pair with their imported gruyere cheese than what happened between vineyard and bottle (or box). Because of the mystery surrounding winemaking, Columbia Crest decided to pull back the veil and allow consumer to learn more about the process through their Crowdsourced Cabernet program. Over the past four months, Columbia Crest has turned a passionate group of wine drinkers, including me, into wine makers. As expected, some people in the wine industry were skeptical when they first heard about the program. But head winemaker, Juan Munoz-Oca never thought twice about getting wine lovers more involved in the wine making process. I was definitely engaged. Under the guidance of Munoz-Oca and Vineyard Manager Juan Uribe, we were fully involved in every step in the winemaking process. With access to cameras placed around the vineyard, winery, and cellars; weather reports; and an online voting system, we were able to take the grapes from the field to the barrels. The graphic below shows how we voted. While I’m pleased with the results, I must admit that I felt a bit of skepticism along the way. 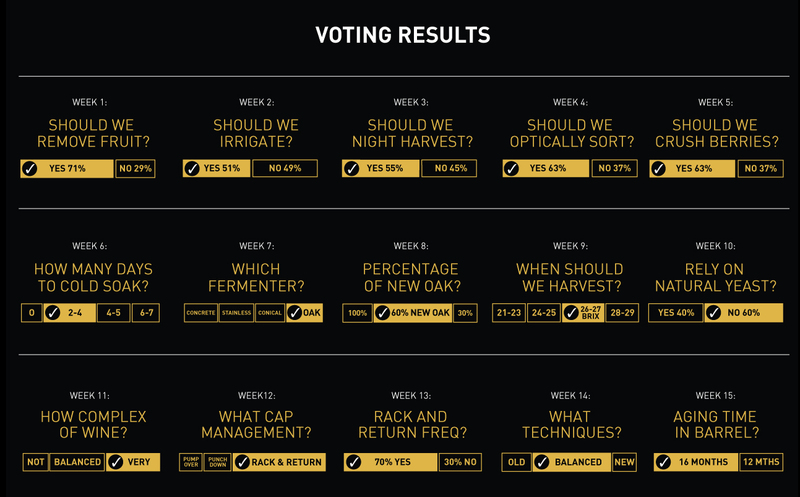 I doubt that any of the people voting had any winemaking experience and I started to wonder if we were making the best choices. All we had to rely on was the data, our judgement, and our personal tastes. But Munoz-Oca took it all in stride. While it was risky to allow consumer to make certain choices, he firmly believes that their input was valuable. One of the biggest lessons that I learned was about the barreling process. In this video, Munoz-Oca shares why new French Oak is used to age wine and the effect it will have on the Crowdsourced Cabernet. Participating in this process has taught me more than any tour ever could. My only disappointment about the Crowdsourced Cabernet program is that I will have to wait at least 16 months to taste the fruits of my labor. But patience is a virtue when it comes to wine making. Knowing that I had some into making the wine will make that first taste much sweeter. You can still learn about wine making. Visit Columbia Crest’s Crowdsourced Cabernet website to watch videos, see photos, and track the wine’s progress from vine to bottle.